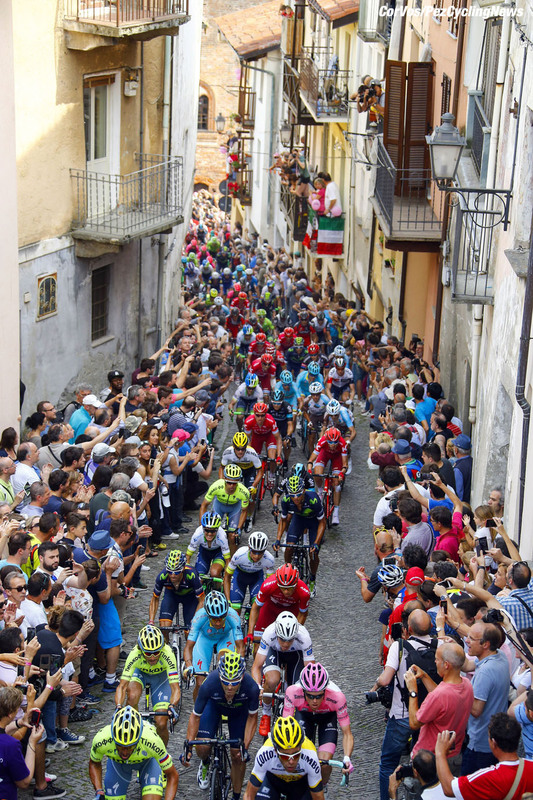 PezCycling News - What's Cool In Road Cycling : GIRO’16 St.18: Trentin Torpedos Break In Pinerolo! 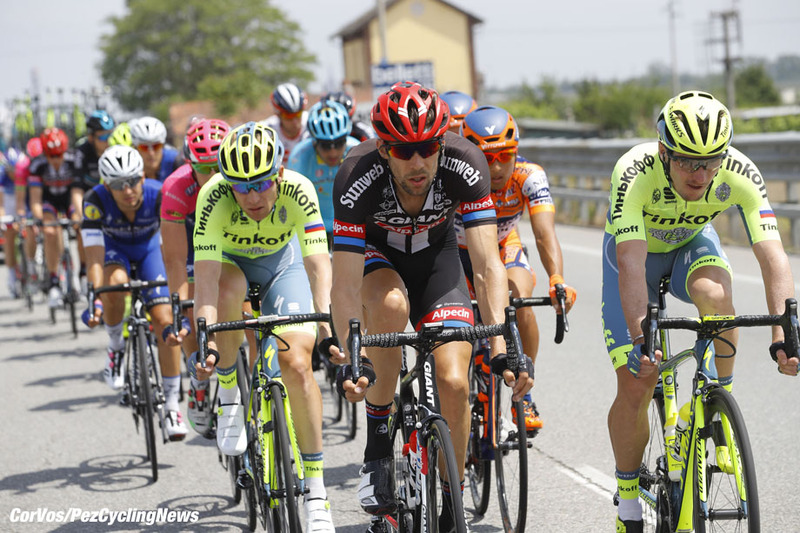 GIRO’16 St.18: Trentin Torpedos Break In Pinerolo! 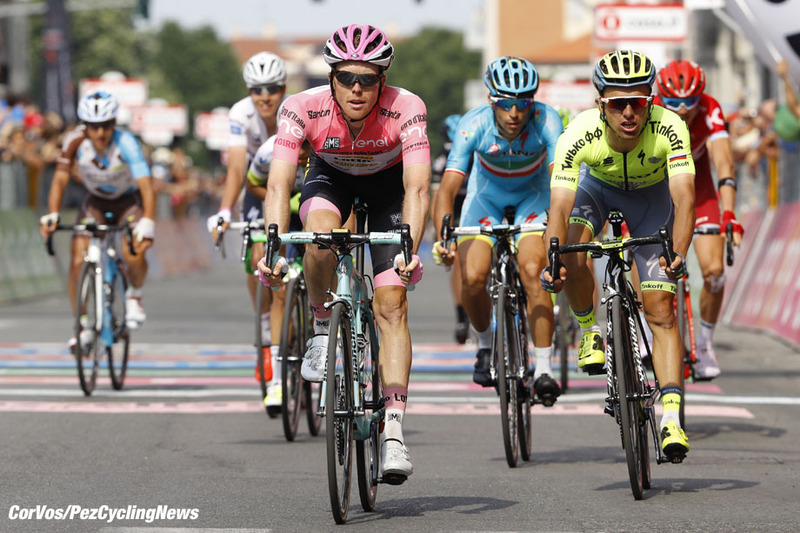 Race Report: Stage 18 of the Giro d'Italia was a day for the breakaway and it looked like a two-way battle for the win as they came to the line. One rider had read a different script though and Matteo Trentin ambushed the lead pair just before the line to take a beautiful win ahead of two days in the Alps. Gianluca Brambilla had seen him coming and was just as happy to see his teammate take the win! This Giro is throwing up a number of questions: is Nibali ailing temporarily or is he now a spent force? Can Kruijswijk actually win this Grand Tour? Will the snow affect the race as it heads into the Alps in the next two days? And who will make their bid for stardom and when? Today, on paper was not that day unless the climb of the Pra'Martino would act as the springboard for a move - (as Pez predicted in his preview). 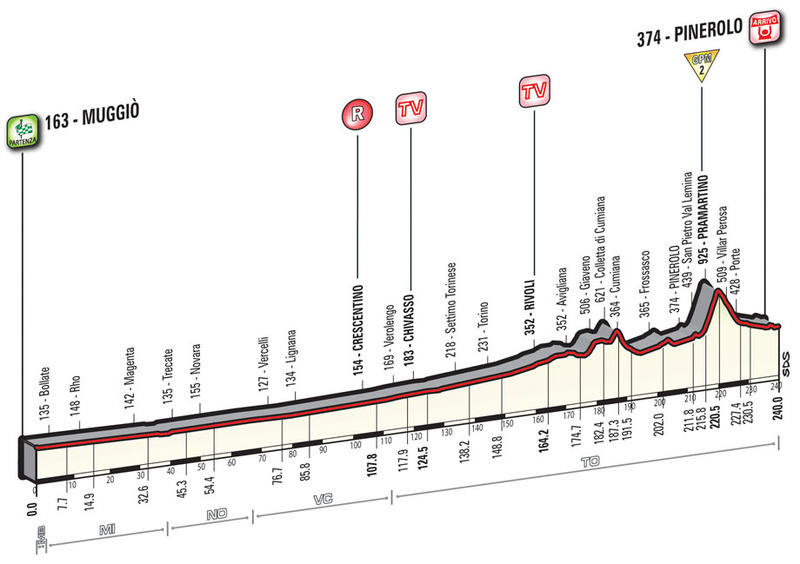 The race would pass through the finish at Pinerolo having crossed the Po Valley before heading up the climb but the riders would have a downhill run-in, albeit with a very technical descent and a steep little cobbled climb just two kms out. With the first half of the stage comprising nothing more than a gentle rise, most of the action would have to come later on in the day. At 240km the main men were taking it easy and a big group formed off the front of the bunch and began to move away. This move had 24 riders in it and some of the names that we’re getting used to seeing on a daily basis were on board. Daniel Oss (BMC) had booked his ticket as had Matteo Trentin (Etixx - Quick-Step) and yesterday’s winner Roger Kluge (IAM Cycling). In fact, a number of stage winners from this race were present with Gianluca Brambilla backing up his Etixx teammate. The full composition was: Axel Domont (AG2R-La Mondiale), Davide Malacarne (Astana), Stefan Kung, Daniel Oss (BMC), Moreno Moser, Ramunas Navadauskas (Cannondale), Gianluca Brambilla, Matteo Trentin (Etixx - Quick-Step), Olivier le Gac (FDJ), Andrey Solomennikov (Gazprom-RusVelo), Roger Kluge (IAM Cycling), Sacha Modolo, Matej Mohoric (Lampre-Merida), Pim Ligthart (Lotto Soudal), Genki Yammamoto, Gianfranco Zilioli (Nippo-Vini Fantini), Nikias Arndt, Alberto Timmer (Giant-Alpecin), Christian Knees (Team Sky), Pavel Brutt, Jay McCarthy, Ivan Rovny (Tinkoff) and Julen Amezqueta Moreno (Wilier Triestina-Southeast). With the sprinters’ teams deciding that this would not be a day for them they were absent from the front of the peloton and it was down to Kruijswijk’s LottoNl-Jumbo team to try and control the race. They were really just trying to limit the losses but the gap had moved out to over 9 minutes with the average speed somewhere around 48kph over the first hour. With the main race settled in behind, the group now had a lead of over 10 minutes as they approached the first sprint of the day at Chinvasso and it was Sacha Modolo (Lampre-Merida) who crossed over in the lead. With the gap pushing out towards 11 minutes thoughts were turning to who could take the stage if the break stayed away until the finish. Most of the speculation in the pressroom favored Brambilla as he was very strong in the first part of this Giro, he wore the jersey and he has a stage in his back pocket already. Given that he also had a teammate in Matteo Trentin there as well, he was an obvious choice. But not the only one, with Nikias Arndt (Giant-Alpecin) also there and also having team support…but he would have to get over the Pramartino before the final run-in. The break was now through Turin the host city for the final stage and heading towards the second sprint at Rivoli. The main bunch was over 8km behind at 11:40 and as the escapees came to the line it was Pim Ligthart who came out to take the points. With the leaders breaching the 12-minute point it was pretty obvious that the winner would come from this group. So all bets were now off as they thought of how to win from their erstwhile companions. First to go was yesterday’s winner Kluge but he was quickly overhauled and then it was the turn of Le Gac and Brutt, the pair getting a small gap but then Le Gac slipped back leaving Brutt to forge onwards on his own. Into Pinerolo for the first time and he was holding a small lead of 17 seconds but it didn’t look too hopeful with Moser and Navardauskas pulling the group. And so it proved as the riders hit the Pramartino and Brutt was brought back with other riders beginning to slip out the back. Trentin was setting it up for Brambilla as Oss and Knees waved goodbye to the group. Rovny made his move and was quickly followed by Brambilla and Moser, these two dropping the Russian in short order. And now we had two in front, although they were being chased by Nikias Arndt. Moser and Brambilla were pushing for the summit and had a lead of 23 seconds but all eyes were on the German sprinter chasing behind. If he could make contact on the descent he would surely be in with the best chance of taking the sprint. With the main race now 13 minutes back Kruijswijk was sitting near the front of the peloton ready to cover any attacks from Valverde or Chaves. And with just the small but tricky cobbled climb of the San Maurizio to go it was looking good for the two in front as Brambilla led over the top but Arndt had been joined by Rovny and they were just 28 seconds behind. Kruijswijk had help from his LottoNl-Jumbo team all day, but will it be the same over the next two days? The peloton was now pushing on the Pramatino and Kruijswijk had been joined by Valverde and Nibali at the head of the rapidly slimming bunch. The leaders were flying down the descent but in the main group it looked like Valverde was getting ready to try his luck, looking first one way and then the other. Battaglin was doing a grand job of looking after Kruijswijk on the climb and the main peloton was shrinking quite quickly. Over the top and no attack came so either it was a temporary truce before the Alps or the unclassified ascent of San Maurizio could see some sparks. At the front Arndt and Rovny had been caught by Trentin and Modolo and they were slowly closing down the advantage of the lead pair. Their gap was just 17 seconds with 4km to run. With just 3km to go to the line Brambilla and Moser were torn between continuing to work in order to come to the line ahead of the chasers, or trying to attack each other. Onto the cobbled climb and they went round the turn just 8 seconds ahead of the chasers where Rovny misjudged the turn and hit the barriers, all momentum now lost. Moser was pushing on the cobbles but Brambilla looked more comfortable on the climb. They were just 2km from the finish and the climb was done as they sped downhill towards the finish. Brambilla was giving it everything to lose Moser but to no avail as his countryman stuck to his wheel. Into the final 800m and it looked to be a battle between the two leaders but Brambilla, sitting on Moser’s wheel, was looking over his shoulder and as they came around the final right hand turn he could see his teammate Trentin charging towards them, having dropped Modolo on the descent. Trentin sped towards his teammate’s wheel and it looked as though Moser had no idea he was there. And then all of a sudden he did as the express train that was Trentin swept by on the right-hand side of the road. Moser had been ready to react to Brambilla’s sprint and he had nothing to get on terms with Trentin’s charge. The win went to Trentin and he punched the air as he crossed the line, Brambilla doing likewise as he finished on Moser’s wheel. Brambilla had seen the blue jersey coming and decided that the day should belong to his teammate and it was a fine finish from the Etixx - Quick-Step pair. Matteo Trentin after the finish: "It's beautiful! Really beautiful! In the classics I was in great shape but I had some back luck, so I came to the Giro with the goal of winning at least a stage." As the winners celebrated we still had a long wait for the Maglia Rosa group as they were only now heading for the cobbled climb. Visconti (Movistar) and Pozzovivo (AG2R-La Mondiale) led them into the climb but it was Kruijswijk who showed the jersey on the majority of the climb, only being passed by Valverde and Nibali as they crested the summit and shot down the descent towards the finish. Into the finishing straight and Valverde was fighting it out with Kruijswijk for the sprint with Nibali, Chaves and Majka all on their wheels. The Spaniard crossed ahead of the Dutchman and now we have the Alps, and the snow, to look forward to over the next two days. 25. Steven Kruijswijk (Ned) LottoNl-Jumbo. 25. Diego Ulissi (Ita) Lampre-Merida at 48:26.